Condo 102 is Surrounded by Sweeping Views of the Ocean, Pool and Gardens. 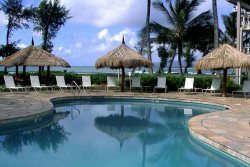 The Islander is a quaint Beachfront Condo/Hotel Sitting on 6 pristine Acres of Tropical Paradise, Hawaiian Decor, Ground Floor Studio with a Queen Bed and Sofa Sleeper. This beautiful unit has everything you need for your stay. You will know you made to Kauai staying here. Great! Absolutely did meet our expectations! We were very happy with the view and location. Very nice functional space. Very easy, the emails were timed well with all the information I needed and the process was very efficient. Yes the condo was perfect. Flawless as far as I know. Very much so.